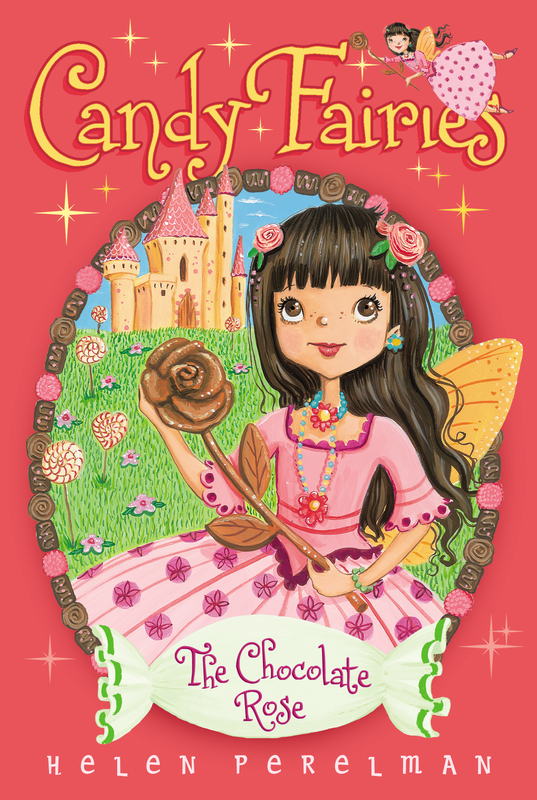 The Candy Fairies put on a sweet show for some special visitors to Sugar Valley in this delectable story. When Princess Lolli’s parents visit the Candy Kingdom, the Candy Fairies know the perfect way to entertain their guests: a talent show! There’s singing! There’s dancing! One Candy Fairy even plays the flute. But as hard as she tries, Cocoa the Chocolate Fairy isn’t the best of performers. She thinks maybe the show would be better if she didn’t participate. But everyone has a special talent—Cocoa just needs to discover what hers is! Cocoa the Chocolate Fairy woke up early. She stretched her golden wings and looked out her window. She was eager to get outside and check on her garden. Just a few weeks ago Cocoa had visited her older cousin Mocha, and her cousin had given her special chocolate flower seedlings to plant in her own garden. Every day for the last week, Cocoa woke up extra early to see if the buds were opening. Maybe today the seedlings would flower! Mocha had a real gift with flowers. Her garden was known far and wide for its beauty and the vivid colors of each blossom. She lived in Sugar Kingdom and had a very important job: She was the chief gardener and tended to the Royal Palace’s flowers for King Crunch and Queen Sweetie, Princess Lolli and Princess Sprinkle’s parents. Cocoa was so proud of her! When Cocoa reached her garden, she was happy to see little stems peeking through the brown-sugar soil. “Good morning,” she said to the seedlings. She bent down and watered the tiny chocolate stems with her watering can. Carefully, she sprinkled water on the center flower. This was a chocolate rose. Normally, chocolate roses did not bloom in Sugar Valley, but Cocoa was determined to grow one. The first thing she did when she came home from visiting Mocha was plant the seedlings. She spread chocolate sprinkles around the stems just as she had seen Mocha do. Cocoa sat down on a large rock candy next to the garden and admired her work. She had cleared the flower bed herself. She had turned the sugar soil and put rock candy along the edges. Cocoa dreamed of having a garden filled with flowers. The garden was not as fancy as the ones at the king and queen’s palace or at Mocha’s, but this garden was all hers. “Sweeeeeeet morning!” a voice called from above. Cocoa looked up and saw her Caramel Fairy friend. Melli’s wings were fluttering fast. Cocoa could tell that Melli was bursting with news. “What’s the good word?” Cocoa called. Melli came swooping down. Her excitement made her wings move quickly, and she floated above Cocoa. “Princess Lolli’s parents, King Crunch and Queen Sweetie, are coming to Candy Kingdom!” Melli exclaimed. “The king and queen are coming here?” Cocoa asked. She had never met the royal couple. She knew them from their large portraits in Princess Lolli’s throne room. They looked like sweet and kind fairies. A visit from them was a very big deal! “Princess Lolli must be so excited that her parents are coming,” she added. “A talent show?” Cocoa repeated. “All the fairies in the kingdom are being asked to help build the outdoor stage,” Melli went on. “An outdoor stage?” Cocoa asked. “Yes!” Melli cried. She did a few more flips high in the air. “The show is next week.” She landed next to Cocoa and sat down on the rock. “I am going to play my new licorice-stick clarinet!” she said, giggling.